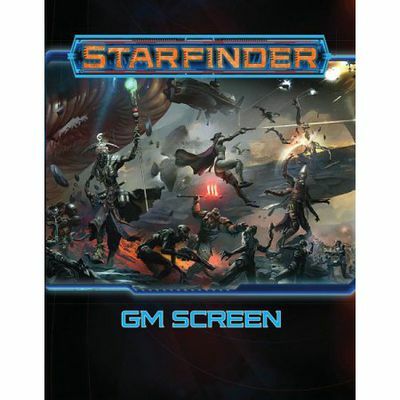 Protect your important notes and die rolls from prying player eyes with the Starfinder GM Screen! This beautiful 4-panel screen features stunning artwork of a battle scene on the player's side, and a huge number of charts and tables on the GM side to speed up play and make sure you've always got key rules at your fingertips. From helpful rules and reminders for both conventional and starship combat to skill DCs and common conditions, the Starfinder GM Screen gives you the tools you need to keep the game fast and fun. Constructed of ultra-high-grade hardcover book stock, this durable screen is perfect for convention play or regular home game use. Screen measures 8.5" x 11" when folded and 34" x 11" in when unfolded.